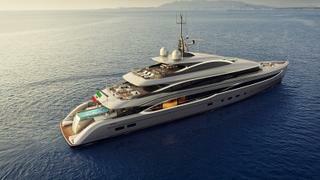 Italian yard Benetti has announced the first sale of a 50 metre fully custom superyacht from its BNow range. Designed by British studio RWD, the steel hull and aluminium superstructure BNow range comprises four models of 50, 55, 63 and 68 metres. The four models are fully customisable, with the yard working with individual owners on their desired layout. The Italian yard used the occasion of the Monaco Yacht Show to reveal that it had sold the first 50 metre BNow yacht to a repeat Benetti client from the Middle East. Other standout features in the range include a rotating bar and fireplace in the owners’ cabin. The 68 metre model is equipped with a firepit on the foredeck which converts into a coffee table. Meanwhile the 63 metre model has a seven metre infinity swimming pool at the fore.